Posted by Natasja in My crochet, My knitting, Pattern, Ta-daah! Do you have a yarn that you love so much that you will search months and months on end for a pattern just so that you can use this yarn? A yarn so soft and light, yet warm in the cold and cool in the heat? A yarn in the perfect shade of grey that will match almost everything in your wardrobe? I have. It’s Gardnstudio Drops BabyAlpaca Silk in 8465 Medium Grey. I bought 12 balls back in August 2015 without knowing what I wanted to make with it. That’s unusual for me because I always find the pattern first and then look for the yarn. I thought I found the perfect crochet pattern in the Samira sweater, and I got halfway through the back when I realised this wasn’t working. The back loop only SC was creating a fabric with so little stretch, I would have had to modify the pattern so much and buy more yarn, that I just frogged it. You can see the frogged project in my Ravelry Projects here. The fantastic Drops pattern database also didn’t have anything suitable for Babyalpaca Silk that I particularly liked. I just made up my own pattern. And it’s mostly a knitted pattern. I used Babyalpaca Silk for my Whispers cardigan which is crocheted, so this time I wanted to see and feel how the yarn looks knitted. I’m so happy I did it this way – this yarn looks better knitted than crocheted I think. As for a pattern, well it needed to be super easy because I’m no good at shaping for knitting and especially not if I have to dream up the pattern myself! Straight sides were what I needed. That made me think of a kimono because isn’t that really just a bunch of squares and rectangles? Surely I could manage that. Turns out a kimono is exactly that: squares and rectangles. I used the plus size DIY Kimono pattern of Nina Scott-Stoddard, as my guide for the pattern pieces. But, me being me, I couldn’t just knit a cardigan. No I needed something crocheted for a bit of flair. That’s were the the “Zen lattice” pattern from Robyn Chachua’s book Crochet Stitches Visual Encyclopedia came in. It was the perfect type of lace stitch and also perfectly name – Zen. Zen crochet border for a knitted kimono cardigan. I mean really! Match made in Japan. I also added two rows of SC in a contrasting colour before I started the knitted section. Just because I can. Below is the “pattern” for my Knitted and Crocheted Kimono Cardigan. I’m saying “pattern” because it’s really just a loose record of what I did. Not technical at all. I’m sure many knitters out there would be able to do a much better job of this than me, but I’m giving you the “pattern” so you can use it as a starting point. 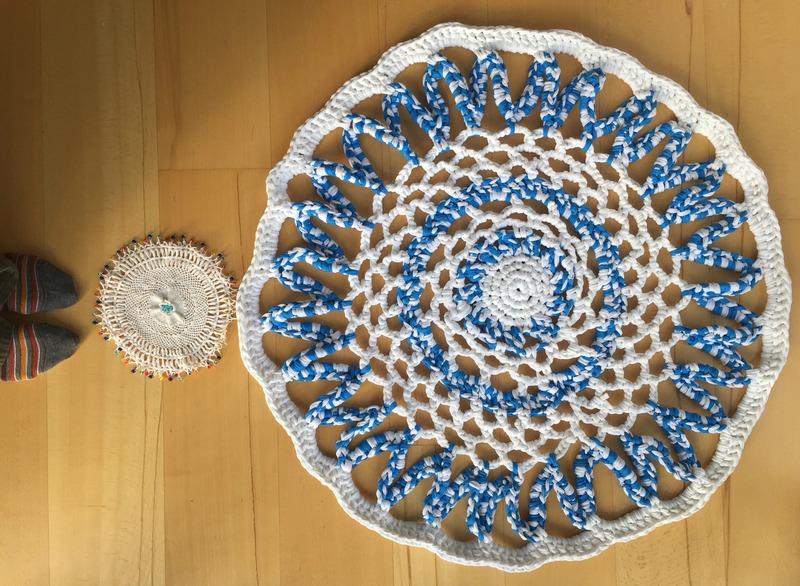 I’m using US crochet terms. 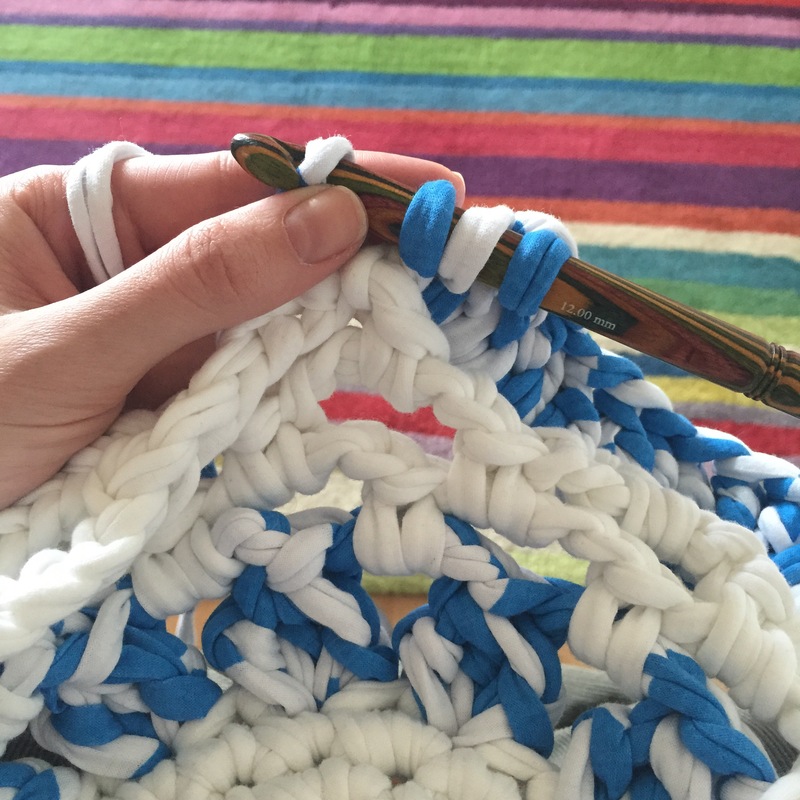 Working from the bottom up you start with the crochet border. Chain 114 (14 x 8 + 2) with 3 mm crochet hook. Now follow rows 1 – 12 of Zen lattice from Crochet Stitches Visual Encyclopedia. In the last row, make 3-chain in stead of 5-chain. Row 14 and 15: change to new colour and make 2 rows SC 2. Cast off. 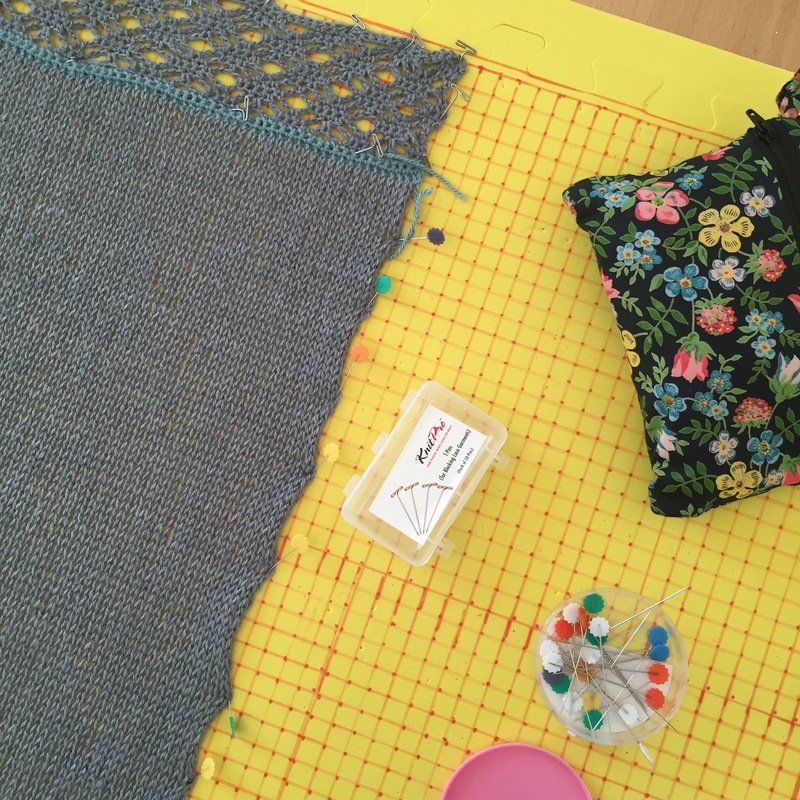 With 4.5 mm knitting needles, start the stockinette stich by knitting the first row, then purl the second row. Continue in in stockinette stitch until desired length. Follow the same instructions as for Back, but cast on 58 stitches (7 x 8 + 3). Follow the same instructions as for Back, but chain 92 (11 x 8 + 3). It’s crucial that you block the pieces before sewing them together. In the photo above you see how the Zen lattice looks before blocking. 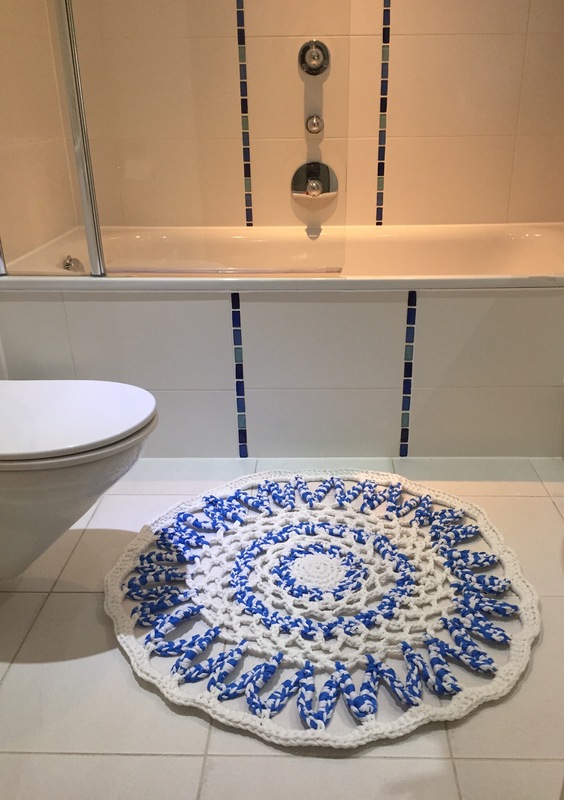 You can’t even make out that it’s crochet! Below you see the lattice stretched out to it’s full potential. The KnitPro t-pins were real life savers for the blocking. I have to warn you though that when I started wearing the kimono cardigan those crochet borders lost their “openness”, so don’t rely on the crochet to add length to the cardigan – it will jump back to almost pre-blocking width. If I knew this, I would have made my knitting much longer. As for sewing up the knitting, I can’t get over how amazing the mattress stitch is for this. It really creates an invisible seam. This video is what I used to see how to make the mattress stitch and how to sew in the knitted sleeves. I love wearing my super soft kimono cardigan, but I do know I could have made a better job of it by 1) creating shaping for the neck and shoulders in the back and 2) by making the body longer. Because of the short boxy shape I also have to think a bit about what I wear it with because it can look very unflattering if you don’t have the right layers underneath. The yarn is this kimono cardigan’s saving grace – it’s so perfect that I don’t even mind having to think a bit harder about what I wear with the cardigan. I’ll even go clothes shopping to find the perfect thing to make this kimono cardigan look its best. I want to wear my kimono cardigan every day! 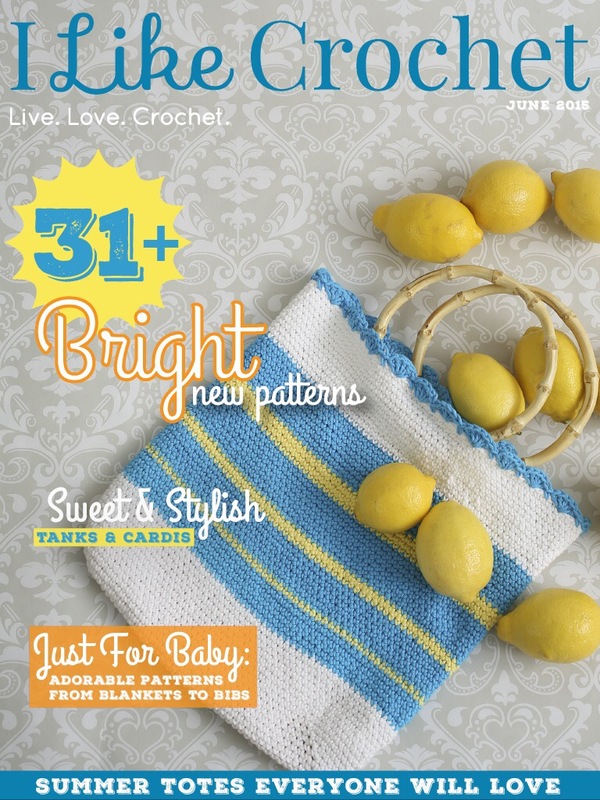 The latest issue of I Like Crochet electronic magazine is out now and it’s all about Summer. It’s difficult to imagine sunshine and warm weather when the temperature for the first official day of Spring in the UK was a mere 12 degrees, with heavy rain predicted for the Bank Holiday on Monday! Come rain, clouds or icy winds, the June issue with the bright colours and Summer themed designs, like the cute tote bag on the cover, is bound to get you in a Summer mood – or at least in the mood to bake a lemon meringue tart. A taste of Summer is just as good as the heat of Summer, right? 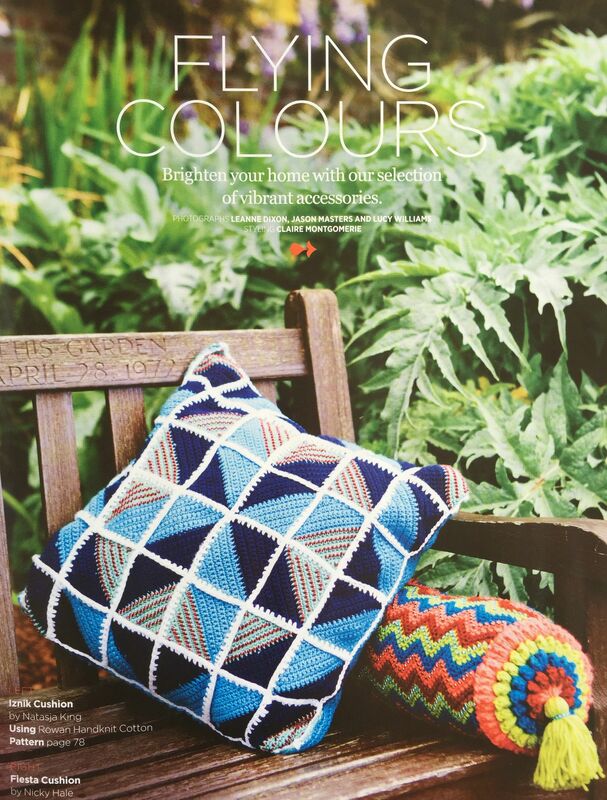 I’m also very happy to say that my Peppy Blossom Bunting is in this issue, helping you welcome in Summer. The bunting is very colourful and not your average bunting – with the bright flower centre it just screams happiness. Bunting is a great way to decorate any space, and this Peppy Blossom Bunting is the easiest way to add a vivid pop of color to your décor. Perfect for any summer party or gathering, you can easily add more or less flags to create just the size you’re after. 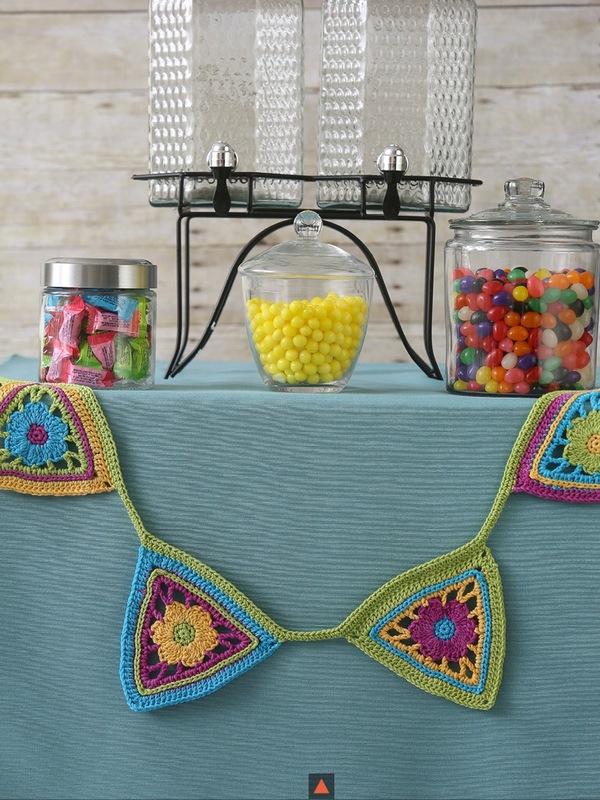 I love the styling of the bunting with the glass containers of colourful sweets. Just like in the April issue when my clutch bags were used as the introductory page for the Springtime Accessories, the Preppy Blossom Bunting is the introductory photo for all the Household Trinkets in the table of contents! What a great compliment! Do you see all the great patterns in this issue? It’s chock full! Two of my favourite patterns are the Deep Cut Moss Vest and the Vivid Coral Reef Top. The Deep Cut Moss Vest is for the advanced crocheter and uses Tunisian crochet and the Vivid Coral Reef Top is nice and easy, but so striking. These patterns, and 29 others are available to subscribers only. A subscription to I Like Crochet include six issues annually, with each issue delivering at least 30 projects and 7 tutorials, for a total of 190 projects and 42 tutorials during the year. Subscription is available for website only, tablet only or for the greatest value and convenience, combine website access to with a tablet magazine subscription. 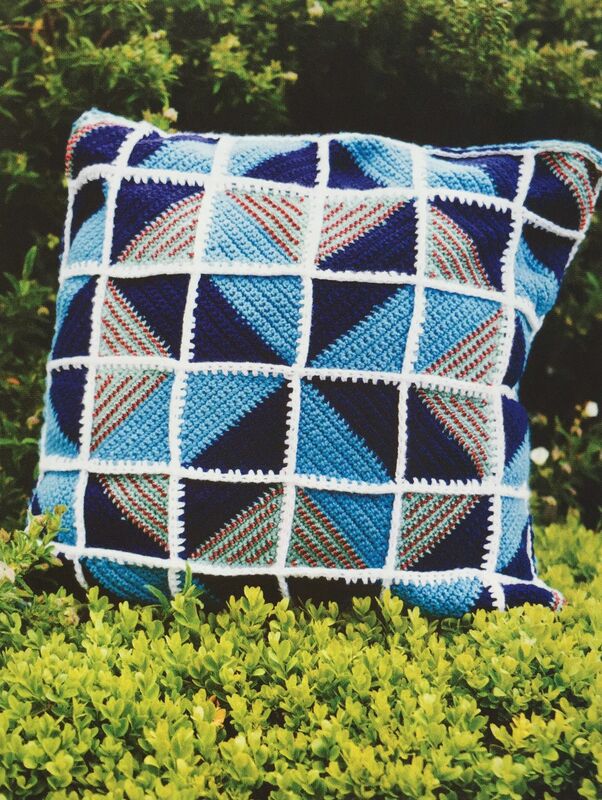 My pattern in a magazine! I am a published crochet pattern designer with a pattern in a magazine! Whoo-hoo!!!! My very first published pattern is the Festive Lace Doily in the December 2014 issue of I Like Crochet magazine. 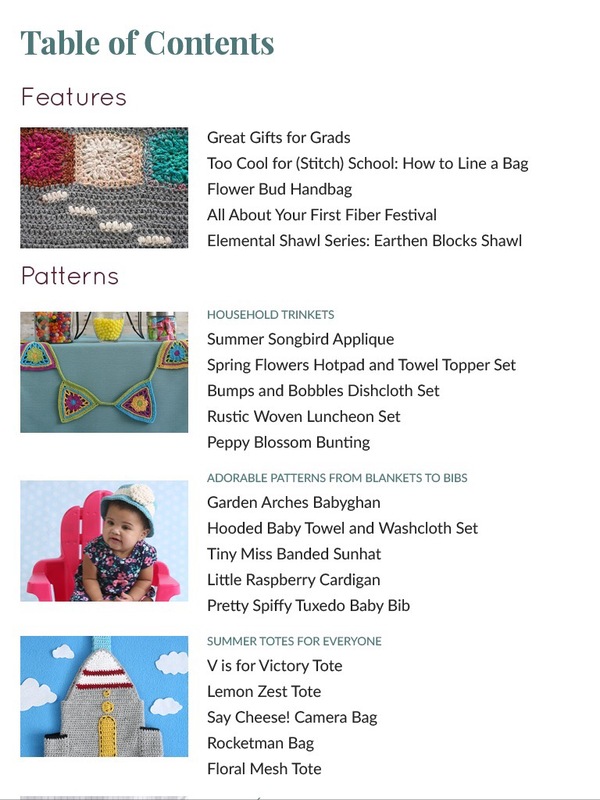 I Like Crochet is a bi-monthly interactive digital magazine optimized for tablets and feature top-rated projects, gorgeous photography, step-by-step instructions, patterns, charts, video and more. Each issue has 30 projects and 7 tutorials. You can buy individual issues for $6.99 or subscribe to any tablet edition on the website, or use your iPad to subscribe in the Apple App Store. It’s a great magazine – and I’m not just saying this because I design crochet patterns for them! I’m so grateful to finally see one of my designs in a crochet magazine. I’ve worked hard to get to this point in my crochet career and it feels good!